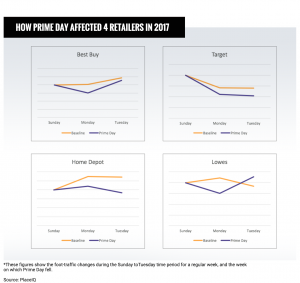 Bricks-and-mortar retailers strike back at Prime Day. As Prime Day has grown — from $900 million in sales 2015, its first year, to $2.41 billion in 2017, according to retail research firm Digital Commerce 360 — bricks-and-mortar businesses have increasing been feeling the effects. PlaceIQ expects a similar drop on this year’s Prime Day among bricks-and-mortar retailers. For the first time, it’s also monitoring grocery stores, because of Amazon’s promotions at Whole Foods. Prime members who shop at the upscale grocery chain between July 11 and 17 receive a free $10 when they spend more than $10. 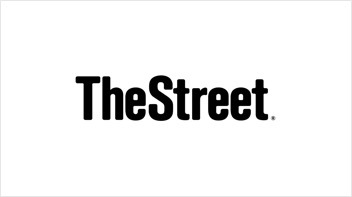 “Prime Day interrupts the weekly rhythm of traffic to hardware and big box stores, and we expect to see the same thing this year, and see if it grows,” Drew Breunig, senior vice president of PlaceIQ, told TheStreet. Grocery store sales may also be impacted, he added.